వోల్టేర్ ఇస్లాం, క్రైస్తవం గురించి చెప్పినది కంచ ఐలయ్య ఒప్పుకుంటాడా ? ఇటీవల ఒక టీవి (టీవి 9) కార్యక్రమంలో మాట్లాడుతూ కంచ ఐలయ్య తనను తాను ఆధునిక వోల్టేర్ గా అబివర్ణించుకున్నాడు. సదరు కార్యక్రమ నిర్వాహకుడు (మురళీకృష్ణ)గాని, చానల్ కానీ ఈ విషయంలో ఎలాంటి ప్రశ్నలు వేయకపోయినా ఐలయ్య నిజంగా వోల్టేర్ చెప్పినవన్నీ అంగీకరిస్తాడా ? ముఖ్యంగా ఇస్లాం, క్రైస్తవం గురించి వోల్టేర్ చెప్పిన విషయాలను తాను కూడా ప్రచారం చేస్తాడా? చేయగలడా? ఇంతకీ వోల్టేర్ ఇస్లాం, క్రైస్తవం, హిందూత్వం గురించి ఏం చెప్పాడు ?…. వోల్టేర్ ఇస్లాం, క్రైస్తవాన్ని గురించి ఇలా మాట్లాడితే , ఆధునిక వోల్టేర్ నని చెప్పుకుంటున్న కంచ ఐలయ్య మాత్రం అందుకు పూర్తి విరుద్ధంగా వేదాలను తిట్టిపోసి, ఇస్లాం, క్రైస్తవాలను నెత్తిన పెట్టుకోవడం విచిత్రం. దీనినిబట్టి కంచ ఐలయ్య అబద్దాలకోరని, వోల్టేర్ వంటివారి పేరు చెప్పుకుని మేధావిగా చెలామణి అవాలనుకుంటున్న అజ్ఞాని అని తెలుస్తోంది. This entry was posted in Nation, Social Issues, Threats and tagged కంచ ఐలయ్య, Kancha Ilaiah on September 26, 2017 by arisebharat. 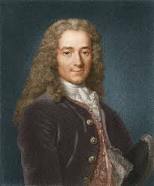 Voltaire on Islam and Christianity – Does Kancha Ilaiah Agree with him ? Kancha Ilaiah presents himself as a modern day Voltaire in a TV9 interview “Murali Krishna Encounter with Kancha Ilaiah – TV 9 “! “Our [religion] is assuredly the most ridiculous, the most absurd and the most bloody religion which has ever infected this world. Your Majesty will do the human race an eternal service by extirpating this infamous superstition, I do not say among the rabble, who are not worthy of being enlightened and who are apt for every yoke; I say among honest people, among men who think, among those who wish to think. … My one regret in dying is that I cannot aid you in this noble enterprise, the finest and most respectable which the human mind can point out.. Contrary to Voltaire, Kancha Ilaiah has great respect for Christianity and Islam and Vedic texts as oppressive texts. Kancha Ilaiah is a liar who hides behind great people like Voltaire to present himself as a free thinker. This entry was posted in Nation, Social Issues, Threats and tagged Kancha Ilaiah, Voltaire on September 25, 2017 by arisebharat. *[Casteism is the major evil afflicting all religious communities in India. This evil must be fought continuously till it disappears from the Indian society. Caste-based discrimination against Harijans (Scheduled Castes) and Vanavasis (tribals) has been mitigated to a great extent in the last few decades through legislation, social and religious reforms, education, affirmative actions, industrialization and urbanization. However, much more needs to be done. A disturbing trend in the battle against this social evil is the emergence of a nexus of hate-filled Islamists, Christian missionaries, misguided and marginal/elitist ‘Dalit’ leaders, Marxists, Anglophile Indian elites (still bearing the white man’s burdens) and lately, western Indologists/South Asian Studies’ specialists. These disparate groups seem to have only one thing in common – a deep hatred for Hindus and Hinduism. Kancha Ilaiah’s book “Why I am not a Hindu” is a manifestation of this disturbing trend. Ever since the book was published, Ilaiah has become a celebrity for various Christian missionary, Islamist, Indian Marxist and other Hinduphobic groups. The title ostensibly seeks to place the book in the league of texts such as Ibn Warraq’s “Why I am not a Muslim” (New York: Prometheus Books, 1995) or Bertrand Russel’s “Why I am not a Christian”. Ilaiah’s book however differs from the others in its undisguised hatred for the targeted community (Hindus), for its crudeness, a general lack of scholarship and academic rigor, in the abundance of cheap rhetoric, in its distortion of facts and finally, in the author’s total lack of understanding of the religion it seeks to denigrate. Surprisingly (? ), the book seems to be quite popular in some American and European Universities. On various Internet discussion lists, scholars such as Lise McKean, Linda Hess, Eliza Kent etc., routinely recommend it as an introduction level reading material on Hinduism! While one can understand the inclusion of critical views (provided they are scholarly) in advanced classes on individual religions, the inclusion of this hate-filled and negative text in introductory courses on Hinduism and India by Professors (often of Indian Marxist extraction) at schools such as the Columbia University, New York is simply baffling, and also disturbing. One never encounters the inclusion of Warraq’s text in elementary courses on Islam, or of Russel’s classic in an introductory course on Christianity. Even for advanced courses on Hinduism, these learned Professors should be able to find something that is more academic, instead of relying on a hate-filled tract. The exception made in the case of Hinduism by ‘scholars’ is reminiscent of trends in Germany in the early 1900s when bashing of Jews was quite fashionable in Universities. What resulted from this ‘scholarly’ hatemongering (combined with other factors) in Hitler’s Germany is well known. The asymmetric, prejudiced treatment reserved for Hinduism needs to be seen in the context of the discussions on Hinduism in ‘scholarly’ Internet forums and in academic ‘South Asian Studies’/Indology conferences, where the quickest way to popularity and promotion of one’s career seems to be merciless, sadistic bludgeoning of Hindus and Hindu dharma. Scholar spin doctors take a vicarious pleasure in branding various aspects of Hindu dharma as ‘Hindutva’, and from there, anything goes. In many cases, the fig-leaf of ‘scholarly’ distinction between Hindutva and Hinduism is also discarded, and Hindu dharma is bashed unabashedly. Even the present book is titled ‘Why I am not a Hindu’, but the subtitle says that it is a ‘Sudra critique of Hindutva’! The cause of this scholarly hatemongering against Hindus by ‘scholars’ merits a separate study, and cannot be dealt with here in any detail. The following review of Ilaiah’s claim to fame (or notoriety, as a Hindu may see it), i.e., the book “Why I am not a Hindu”, was initially written in 4 parts by Sri M.V.R. Sastry, Editor of Andhra Bhoomi, a leading Telugu newsmagazine. The Telugu text was then translated into English by Sri K. Satya Deva Prasad, and published in two parts titled ‘Ilaiah’s howlers – I and II’ in the magazine ‘Bharatiya Pragna’ (Sept. 2000, Vol. II, No. 9 & Oct. 2000, Vol. II, No. 10). What are the ‘five great books’ of the millennium? It is a question that will baffle most of the learned and the intellectual bibliophiles. Why? Because enormous amounts of literature has been composed in every language, say in Telugu, over the past thousand years, in various forms like the short story, novel, poetry, social critique, etc.,. In India, there are over a dozen such major regional languages. Put together, the number of all the books produced in English, Hindi and regional languages goes into thousands. To pick up just five out of that mountain of books is a dizzy task even to the highly learned and informed. Of the above, the first four books were authored and published several years ago, whereas Ilaiah’s book is quite a new entrant in the market. It has been creating its own kind of sensation since its first publication. The English original has even been translated into Telugu, Kannada and Tamil. People are naturally curious as to what this “great” book of the millennium has to offer to the reader. Apart from being trumpeted as the book of the millennium, the author seems to be fairly convinced about the greatness of his book even before it entered the market! His pompous declaration, “My date of birth may matter little to the country but the date of publication of this book is very important. I am confident that it is going to influence the march of history.” The declaration reflects the author’s mental immaturity. So far, hundreds of books have come out dealing with Dalits, Bahujans, weaker sections of society, their plight in the society and so on. Of these, many are penned by people who actually belong to the suffering, disabled strata of the society. But what puts Ilaiah – in his own estimation – distinctly in that class is his so-called personal experience. According to his detailed self-description, Ilaiah has the distinction of not only being born in the backward Kuruma caste in a backward Telangana village, but of actually rearing sheep while he was young. He describes at length how meticulously he learnt the intricacies of his caste-craft and its lingo; of the esoteric techniques to distinguish various sheep like the bolli gorre, the pulla gorre, the nalla gorre; of the diseases that attack the sheep; of the rustic herbal concoctions used to cure the diseases; of the hot-iron application in case the paltry medication fails; of the task of mid-wifing the birth of sheep-lings; tending to the young and grown-up sheep; above all, the expertise to shear wool from sheep without hurting it. This is the source of the caste-based knowledge and experience acquired by the millennium author. In addition to sheep rearing, he acquired a doctorate in academic studies and became Associate Professor of Political Science at Osmania University, which knowledge and academic expertise he has used in analyzing his childhood experiences and in formulating his “Dalit-Bahujan” theories and perceptions. The education acquired by Ilaiah would have found its consummation had he utilized it to analyze, clarify and rectify the ideas he acquired during his childhood through mere hearsay. It would have also served the cause of the Dalit-Bahujans so dear to his heart. But that was not to be. What actually happened in Ilaiah’s case is quite different. He never verified what he saw and heard in his childhood with his immature inchoate capabilities in later years. He never seemed to consult any worthwhile source before making venomous remarks about the Brahminism and Brahmin lifestyle, much less did he observe the present actual situation. In his childhood, certain things were clear, some were not (as Iliah himself admits). Yet he never bothered to understand them even in his “enlightened” years. What Ilaiah declares as the hate-targets of upper castes are in fact icons of worship for the latter. Annam or food or crop is worshipped as Parabrahman (the highest form of God). The mud that gives food is one of the five primal elements (prithvi) worshipped. Even the urine and dung of the cow is considered sacred not to speak of the mother cow itself. The bull is worshipped as the mount of God Shiva. Yet Ilaiah’s wisdom sees hate all the way! On his own admission, Ilaiah does not know a thing about the workings of Bapana and Komati individuals and familial and social relations. He has no acquaintance with what is happening in those families, their customs, practices at all. Yet he asserts with authority as to how disgusting the upper caste lifestyles are! Look at the following quotation where Ilaiah “unearths” unheard of truths! When did he observe these customs? How often are they practiced now-a-days? – These questions never bother Ilaiah. Nor did Ilaiah care to look at the full flowing hair of Brahmin widows that he comes across in his University campus or on the road. He never cared to ascertain whether these customs are still in general practice. What profound Puranic wisdom! Goddess Saraswati is illiterate; Sri Krishna “stole” Gita; Sita went to forest with the adolescent Rama even before marriage, occupied the kingdom of Tataka and after marriage she got Shambuka killed and occupied his kingdom (of a poor hut!). Well to counter these charges of murder and trespass framed by Ilaiah is beyond the capability of Gods what to speak of us mortals! They are so senseless. Claiming to show off his knowledge of Ramayana, Ilaiah-like intellectual declares that the Ramayana is about the story of defeat of Karna at the hands of Katama Raja. What Karna of the Mahabharata has to do with the 14th century Nellore king Katama Raja is anybody’s guess. That apart, does this gentleman possess even a paltry acquaintance with the village deities whom he quixotically pits against the Hindu deities? Let us examine at some length. His grouse is that if other Gods are conceived as having one wife (Here the word he uses to denote the husband with one wife is ‘Sativrata’ which is a travesty of the actual expression ‘Eka Patnivrata’. So much for his knowledge of Hindu idiom), why should Krishna be depicted as a Casanova? Sri Krishna might feel happy for Ilaiah siding with him. The Lord of the three worlds would definitely get enthralled for having found a staunch advocate in Kanche Ilaiah to argue against the mountainous injustice done by Hindu devotees in treating him as butter stealer, saree-grabber as also for all the insults meted out to him at the hands of the wicked Hindu Brahminical devils! That is it! When RSS people shouted “Jai Sriram” Laloo faced them with the slogan “Jai Srikrishna”. This jostled the Brahmin Pundits into a fix. Not foreseeing such a twist to the events, the nationalist Brahmindom of yore declared Krishna as the author of Gita. Now that he is found in Laloo’s camp, the Brahmins fell in a trap. So goes Ilaiah’s gleeful daydreaming. Ilaiah’s dreaming apart, what is so damaging if Laloo raises slogans in praise of Sri Krishna, the Jagadguru and Jagannatha? Let him also gets some religious merit. What loss does Hindutva incur? Why do Hindus need to fell embarrassed if Laloo Prasad Yadav praises Lord Krishna. Or shall we feel happy that of all Hindu Gods who faced brickbats from Ilaiah, at least Krishna is treated as a B.C. and let off the book! On the contrary, in his Telugu version of ‘Why I am not a Hindu’, the author does not take kindly to Krishna. Ilaiah pummels Sri Krishna’s image in his own inimitable simpleton-fashion! At a time when the likes of Kancha Ilaiah could not avail the benefit of modern education without any degree or doctorate, without occupying any post in any University, how can a Yadava write a Bhagavad Gita? This is a potent question posed by Master Ilaiah. In both the events – whether the answer is ‘Yes’ or ‘No’, Krishna, and Hinduism along with him, stand convicted. To put Ilaiah’s litigation in a few words – if we say that a Yadava cannot write such a profound work at such an unfavourable time to the BCs, one should admit that Krishna is not a Yadava. On the other hand, if Krishna choose to side with Laloo and Ilaiah and declares that he belongs to Yadava community, then he should also admit that he did not write the Gita. The Brahmins needed to project a person who could rebuild a consent system to contain the Yadava revolts. The Brahmins created an image of one who was said to have been born and brought up among the Yadavas themselves. They worked out the strategy of creating a Krishna who was born in a Kshyatriya family and brought up in a Yadava family. The young Krishna grows up in a Yadava culture, but the political Krishna never identifies himself with Yadava culture. In no single incident did he stand by the Dalit Bahujans. It did not matter whether his beloved was a Yadava-Radha, or whether the other Gopikas were Yadavas. All his legal wives were Kshatriya women.” (p.84-85 Eng.) (P.103 Telugu). “All the Kautilyan statecraft were exhibited by Krishna in the battle field” (P.86 Eng; P.103 Tel). There is no better way to stand Indian history on its head! Any thing is possible with Iliah’s fertile imagination. Thus, according to our ace-academician, a hero combining the spirit of Kautilya and Vatsayana was needed at the time of Mahabharata. So the Brahmin nationalists of that period (?) accepted Krishna as hero! When did Mahabharata take place? To which period did Kautilya and Vatsayana belong? How on earth could Krishna who predates the other two savants mimic them? This is the lunatic’s history our Professor doles out. Thus what Kautilya said about errant state functionaries is straightaway pasted to Brahmins! That is Ilaiah’s sleight of hand! “The fight was between the minority Pandavas (Brahmins, Kshatriyas and Vaisyas were always a minority – they constitute 15% of the population) and the majority Kauravas. The hundred Kauravas stood against Brahminical Dharma and represented Dalit bahujans, whereas the five Pandavas represented the Brahminical minority. In the fight for land (and for the kingdom) Krishna stands by the minority. The majority were not willing to give up the land they acquired through sweat and blood. Whenever such attempts were made, either by Yadavas or by other Dalit forces, Krishna’s Gita was effectively used to manipulate them into submission.” (p.85 & 86 . Eng; p.105 Tel.). This outlandish interpretation of Mahabharat will certainly find the ardent readers of the classic dumb-struck! How come we have first cousins of whom some are Brahmins and some Dalit bahujans? What are the difficulties undertaken by Kaurava Dalit Bahujans to acquire land? (except fraud and misrepresentation). Majority reluctant to part with, chances of another revolt from Dalit bahujan camp (how many times? ).What has Gita got to do with all this? What treachery and breach of trust did Krishna commit? So far Bharata war is believed by almost all those who knew the epic to be a feud between two groups of cousins spurred by envy and greed for kingdom. Now Ilaiah’s prophetic perception tells him that it is a feud between OCs and BCs! If you cross ‘Deva’ with ‘Atideva’, you will get the compound word ‘Devaatideva’. But you will find no such mongrel word. In fact, one need not fear for misspelling and misuse of words. Anything is fair with Ilaiah if only it is used against Hindus and Hinduism. Probably Ilaiah thought that ‘devaatideva’ is the correct form of ‘devaadhideva’. “The daily menu of Brahmins consists of at least 12 curries”. Thus Kancha Iliah depends more on heresy regarding the lifestyle, customs, food habits, social family routines; fills gap rest with his own imagination without ever bothering to verify what he heard or imagined; accuses upper castes even for his fellow bahujans not getting photographed or portrayed; parades his illogical, baseless, senseless picture of society as the most authentic and authoritative one. Such writing is unbecoming of a University teacher to say the least. Ilaiah’s ire is not just confined to Hindu upper-caste social customs and practices. It has also engulfed their deities, sacred beliefs and sentiments. But how authentic is his critique? Sadly enough, it is crude and uninformed in the extreme. It means “in matters of Dharma, Artha or Kaama (desire), you should not be unjust to her”. “Naati charaami” (I shall not transgress). Just as we say Dharma and Artha and Kaama in English, we say Dharmecha, Arthecha, Kaamecha (‘cha’ = and) in Sanskrit. Kaamecha means “and kaama” (or “kaama also”). Whereas Ilaiah twists kaamecha into ‘kaamechha’ with emphasis on “chha”, which means desire (more precisely, sexual desire). Such violence is not in the least to be seen in the Dalitbahujan deities of South India… not one story can be picked in which violence forms the major theme. Pochamma, maisamma, maaramma, potharaju, malliah like gods’ and goddesses’ private life (including sexual life) is not known at all to the Dalitbahujans. Such discussion is out of place in the context of those deities. Goddess Parvati had a desire to have a child. She begs Sankara. Sankara says that all those born in Kali Yuga are their progeny and hence there is no need for more kids. But Parvati persists saying that one should have one’s own children and there lies the fulfilment of motherly instinct. But Sankara refuses again. Meanwhile, Laxmi and Saraswati come to Parvati and offer her their own children for adoption. They have an eye on Parvati’s wealth. But Parvati refuses the offer saying that I myself should give birth to a child and bring it up in seven mansions with silver swings. She again approaches Sankara and pesters him for the boon of a child. Sankara plans to cajole her for the time being by giving her a jasmine flower and went away to turn the wheel of creation. Parvati ate the flower and within a few hours suffered labour pains. She sent for Sankara who learnt the truth and went to Parvati’s parents. He chided them for Parvati becoming pregnant in his absence. Then he went to Parvati, tied her limbs, made her walk on a caltrap (Palleru Kayalu). Then the foetus in the womb of Parvati speaks out: “Do not weep, my mother. I am your support.” Meanwhile, the pyre burned out but no harm came to Parvati. Born in Kaadu (cremation ground in Telugu), the child was named Pochamma. Sankara then realises, “My wife Parvati is chaste. The child born in cremation with wood shall thereafter be called Karrapochi.” (karra = wood) The child came of age and desired to be worshipped by one and all. She demands the same from her father which displeases him. Sankara curses that Pochamma shall not have sexual enjoyment. Later she was married to a “forest recluse”. Pochamma becomes the presiding deity of small-pox. She assumes a fearsome appearance when angered. She makes all suffer alike – near and not so near. This is one of the many stories which are in vogue among the common people. As already admitted by him, a few like Ilaiah may not know much about the private (including sexual) life of Pochamma, most of the people who worship her knew all these facts of her life. Moreover, she does not owe her popularity to the imaginary role attributed to her by Ilaiah, namely, the role of a rustic doctor ‘who might have invented the cure for small-pox’. At least the common people who worship her do not do so because of what the likes of Ilaiah imagine. Hindu deities and Dalit deities do not turn antagonistic overnight because the great Ilaiah said so. The origins of Dalit deities are inseparably linked to the Hindu, Brahmanic, Puranic deities however much Ilaiah may deny it. As shown in Pochamma’s story, none other than the prime Hindu deities Siva and Parvati are the parents of the so-called Dalitbahujan deity Pochamma. Not only to her, they are the parents of Ellamma and Poleramma too. Parvati wanted to accompany them. So she was taken into cart. After covering some distance, sweat appeared on Siva’s face. A drop of sweat fell on the earth in a termite mound. It was swallowed by a snake in the mound and gave birth to a girl child. Unaware of this, the gods went on their way. On return, Parvati heard the girl’s cry and wanted to lift her up. On Parvati’s request, Siva dropped a lock of hair to help the child crawl up. But the mischievous child started swinging in the mound with Siva’s hair. Siva felt pain and told her to come up. She refused asking that she needs water, goat, rice, fruits and many other articles for food. To satisfy her, Vishnu assumed the form of Pothuraju, Siva as Baindla, Brahma as Kinnara, Parvati, Laxmi, Saraswati, Arundhati, Savitri as “muttaiduvas” went to the mound and requested the girl to “Ellu Amma” (Come out, mother). She came out and thereafter called as Ellamma. Ellamma is also called Maahuramma, Akkali Devi, Renuka Devi, Ekaveera. Parvati and Parameswara marry her in her twelfth year to Rishi Jamadagni. Parasurama was born toJamadagni and Ellamma. Once Ellamma or Renuka was immersed in watching the passing Gandharvas and displays her temptation. Jamadagni orders Parasurama to cut down his mother. Knowing the plight of Renuka or Ellamma, a maadiga woman embraces and weeps. Parasurama cuts both of them. Pleased by Parasurama’s obedience, Jamadagni grants a boon. Parasurama asks for his mother’s life. Jamadagni bids his son to join the head to the trunk and sprinkle sacred water. In his hurry, Parasurama joins the wrong trunk to his mother’s head. Both the dead ladies come alive but one with a Brahmin trunk and maadiga head as Ellamma, the other with a Brahmin head and maadiga trunk as Maaramma. Poleramma is another village deity born out of Siva’s sweat. She takes revenge on Prataparudra in the most fearsome way by spreading epidemics, killing people and so on. Another deity called Ankamma is considered to be the mother of Trimurtis. The origin and lives of almost all these deities is replete with violence, bloodshed, spitefulness, etc. Beside exerting to divide the present day society and pit Dalitbahujans against other members of the society, Ilaiah has tried hard to divide gods into Dalit and Hindu classes with no connections whatsoever. He has also attempted to present Hindu gods as bearing arms to massacre Dalits and Sudras even though there is not an iota of evidence to that support. He has tried to paint ‘Dalit deities’ as peaceful, non-aggressive benefactors in the form of tank builders and herbal healers. By the way, he might as well recommend a professorship to Pothuraju! “I do not know, did not try to know, do not intend to know,” says Ilaiah. Had he tried, he would have obtained the copy of a book named “The Village Gods of South India”. Even the most cursory perusal of that book might certainly have convinced him that it was not written to purposely mislead the great Ilaiah because it was published in 1916, at least three to four decades prior to his birth. He might have also realised that it was authored by one Reverend Henry Whitehead with formidable credentials – a Bishop of Madras who roamed all over South India with the sole aim of converting Hindus to Christianity by making an in-depth study of Hindu village deities, festivals and fairs, sacrifices and other customs. The book might have offered a mine of authentic information as it comes not from a Hindu agent. The book, on its 119th page describes an interesting account of the origin of the custom to sacrifice he-buffalo to the village deities. In ancient days, the story runs, there lived a karnam, i.e. a village accountant, in a village to the east. He was blind, and had only one daughter. A Pariah, well versed in the Vedas, came to the village in the disguise of a Brahmin. The elders of the village were deceived and induced the blind karnam to give his daughter to him in marriage, that he might succeed to the office of karnam in due time. The marriage was celebrated by Brahmin rites, and the karnam’s daughter bore sons and daughters to her Pariah husband, without any suspicion arising in her mind as to his origin. After a time a native of the Pariah’s own village came to the place where they were living, and recognised the Pariah disguised as a Brahmin. Seeing however that he was a man of influence he said nothing to the villagers, but went and told the Pariah’s old mother. As he was her only son, the old woman set out in search of him, and came to the village where he lived, and sat down by the well used by the caste people. The Pariah happened to go there, and recognised his mother; so he took her to a barber, had her head shaved, passed her off as a Brahmin widow and brought her to his house, telling his wife that she was his mother and was dumb. He took the precaution strictly to enjoin her not to speak, lest her speech should betray them. One day the wife ordered a meal with a dish made of wheat flour baked with sugar and made into long strings. During the meal, the mother, forgetting the injunction of silence, asked her son what the preparation was, saying it looked like the entrails of an animal! The wife overheard the remark, and her suspicions were aroused by the fact that her mother-in l-law could speak, when her husband had said that she was dumb, and did not know a common Brahmin dish like the one prepared by her; so she watched their conduct, and felt convinced that they belonged to a low caste, and were not Brahmins at all. Accordingly, she sent their children to school one day, when her husband was away from home, managed to get rid of the mother-in-law for a few hours, and then set fire to the house and burnt herself alive. By virtue of her great merit in thus expiating the sin she had involuntarily committed, she reappeared in the middle of the village in a divine form, declared that the villagers had done her great wrong by marrying her to a Pariah, and that she would ruin them all. The villagers implored mercy in abject terror. She was appeased by their entreaties, consented to remain in the village as their village goddess, and commanded the villagers to worship her. When she was about to be burnt in the fire, she vowed that her husband should be brought before her and beheaded, that one of his legs should be cut off and put in his mouth, the fat of his stomach put on his head, and a lighted lamp placed on the top of it. The villagers seized the husband, stripped him naked, took him in procession round the village, beheaded him in her presence, and treated his leg and fat of his stomach as directed. Then her children came on the scene, violently abused the villagers and the village officers, and told them that they were the cause of their mother’s death. The deity looked at her children with favour, and declared that they should always be her children, and that without them no worship should be offered to her. The Asaadis claimed to be descendents of these children, and during the festival exercise the hereditary privilege of abusing the villagers and village officers in their songs. After being beheaded, the husband has born again as a buffalo, and for this reason a buffalo is offered in sacrifice to vuramma, the village goddess. Killngs of hundreds of animals to propitiate the so-called Dalitbahujan deities and the blood-curdling rituals do not perturb our angel of peace and non-violence! Per Ilaiah’s scale of culture, offering curd-rice and yellow-rice to the god is sinful. But beheading buffalos and goats is meritorious. This is what the learning of Ilaiah taught him. “In the history of this country, the date of birth of this book is more important than my date of birth,” boasts Kancha Iliah in his preface to the Telugu version. “While the author was tending to cattle, teacher Rajalingam took him to school and there registered the date of birth as October 5, 1952 on the basis of the crude guess of his grandma” – so declares the author towards the end. In reality, by the time Ilaiah took birth, five years passed after we had got our Independence. By that time, a number of persons who belong to Ilaiah’s Dalitbahujans were educated for some generations and occupied important positions in various fields. Poets like Joshua, politicians like Damodaram Sanjivaiah have already illumined public life as beacons of Dalits. Even in Ilaiah’s own Telangana, the oppressed peoples like Dalits, barbers, washermen, farm-labourers have acquired awareness through adult schools, revolted and led an armed struggle against the tyrannical Nizam several years before Ilaiah’s birth. Yet, Iliah claims that he belongs to the first generation of educated Dalits! Such wise men like Ilaiah should know better before making an accusation or levelling a charge. Prior to the formation of Andhra Pradesh State, the Telugu speaking area was a part of the Madras presidency. The indigenous education system existing at that time was vividly described in books like 1. The Beautiful Tree – Indigenous Indian Education in the Eighteenth Century, 2. One Teacher, One School, etc. These books detail the information gathered by British officials submitted to the British government of that time. It reveals that under indigenous system, education was not the monopoly of any one caste. It was within the reach of all castes and classes of people. Both teachers and students came from all castes. For instance in the Madras Presidency, of the total number of students, 22% were Brahmins, 10.4% Vaishyas and the rest were Sudras and other castes. Even though the number of Dalit students was much less compared to their population, their number was not as low as it is made out by the likes of Ilaiah. There were both students and teachers from the Scheduled Castes. These facts show that there was some education among the Dalits much before Iliah. But he never cares for such truths. Ilaiah does not respect Ambedkar’s findings on the origins of Sudras and Brahmin-Dalit relations, yet he quotes Ambedkar when it suits him. Had Iliah the least knowledge about what Ambedkar’s writings on these issues say, he would not have asserted that “Rama was an Aryan invader and Ravana, a Dravid saviour” (p. 11); “the Aryans massacred the Adidravidas (Ilaiah’s Dalitbahujans) in thousands” (p. 93); that South India was occupied by Aryans after the death of Ravana; that South India until then was casteless until the Brahmins from the North established it there; that Brahminism was imposed from above in South India, i.e., an external imposition (p. 107-108). 1. “The Sudras were one of the Aryan communities of the Solar race. According to Ambedkar, the reason for downfall of the Sudras in the social scale is the oppression and humiliation they inflicted on the Brahmins. How come Ilaiah, an ardent follower of Ambedkar says “three thousand years Brahminism tortured us more than Hitler’s gas chambers”? Again Ilaiah pontificates, “I am writing this book only for those who do not shut out their minds but read it with open minds… those who refuse to face new questions and learn new answers will perish.” This pontification applies more to Ilaiah himself. If he has anything of an open mind left in him, there is one book which Iliah should read. The book is recently released and the author is an American. The subject of the book is also Hindu Dharma. While Kancha Iliah poses the question “Why I am not a Hindu”, David Frawley answers through the book “How I became a Hindu” in 200 pages. David Frawley is more or less of the same age as Iliah. If Iliah’s parents are born in a sheep-rearing caste, David’s parents belonged to a dairy farm. His father is Irish and mother German. Like Ilaiah’s family, David’s family is not much educated either. Ilaiah realised the greatness of the Christian Church only after being educated. But David was born into a pure Catholic-Christian family. His uncle worked as a Christian evangelist in South America. David’s mother desired that her son should follow the same vocation. Thus, a middle class, West American (Wisconsin) born Christian, David Frawley was not satisfied with the Christianity he imbibed since childhood. He started on an intellectual journey studying Communism, Taoism, Zen, Buddhism, Islam and many other schools of thought, posed questions, sought answers and finally came to the conclusion that only Hinduism withstood all tests of logic and is capable of showing the way to the highest spiritual fulfillment of man. He disproves the current intellectual fad that the Vedas are crude appeals to natural forces by aborigines and only Upanishadic teachings are the essence of Hinduism. One who was destined to be a Christian preacher, not only left that religion and adopted the Hindu religion which the so-called ‘secularists’ considered as the cess-pool of superstition and polytheism, full of inequality and ignorance. The circumstances that led and the influences that paved the way for this transformation were picturesquely dealt with in the book “How I became a Hindu”. The book is brought out by the Voice of India Publications, 2/18, Ansari Road, New Delhi – 110002. Priced at a modest Rs. 120/-, the book is an eye opener to the half-baked critiques of Hinduism. Frawley explains his journey towards Hinduism as follows (p. 11-12 and 81-83) – Born in America, traveled widely, studied most religions, David Frawley comes to the conclusion that Hindu Dharma is the path-finder to the world and answer to all questions. Having concluded so, he joined the Hindu-fold and proudly declares that he is a Hindu. But Kancha Ilaiah, born in India, brought up in Hindu civilisation and occupying a professorship in an Indian university declares, “We hate the Hindu religion, we hate Brahminism still more.” He raves that the Hindu religion destroys all that is lofty and sober in man… ‘Charity and kindness are not to be found anywhere in Brahminism. Brahmins and Baniyas never even thought of the good of other people’. But, according to him, to split open the belly of a cow is not himsa. Again, ‘all those born in the Brahmin caste should be prohibited from the vocation of authorship for at least one hundred years. It is a historical necessity to augur a time when Brahmins in hundreds are made to sew footwear and sweep the roads. Hindu temples should be captured, the Brahmins be driven away and their gold, silver and land should be confiscated.’ He is infected with Brahmin hatred and is exerting every nerve to spread the infection. Thus the likes of Iliah mistake their own intellectual delirium for a commitment to some cause. Only Hindu dharma can save him. This entry was posted in Social Issues, Threats and tagged Dalit Movement, Kancha Ilaiah, MVR Shastry, Why I am Not a Hindu on October 23, 2012 by arisebharat.